"I don't want to pretend anymore." Focus Features has revealed the first official trailer for Boy Erased, an adaptation of the book of the same name by Garrard Conley. The story is about the son of a baptist preacher who is forced to participate in a church-supported gay conversion program - similar to the one also seen in The Miseducation of Cameron Post. Boy Erased is directed by Australian actor-filmmaker Joel Edgerton (also of The Gift previously), who also wrote the script, and stars in the film. The main cast includes Lucas Hedges (from Manchester by the Sea) as Jared, with Nicole Kidman & Russell Crowe as his parents, plus Xavier Dolan, Troye Sivan, Jesse LaTourette, Britton Sear, David Ditmore, Matt Burke, and William Ngo. As expected, this looks excellent so far - with strong performances throughout to make this story more meaningful. It looks like a powerful film that will get people talking when it opens this fall. 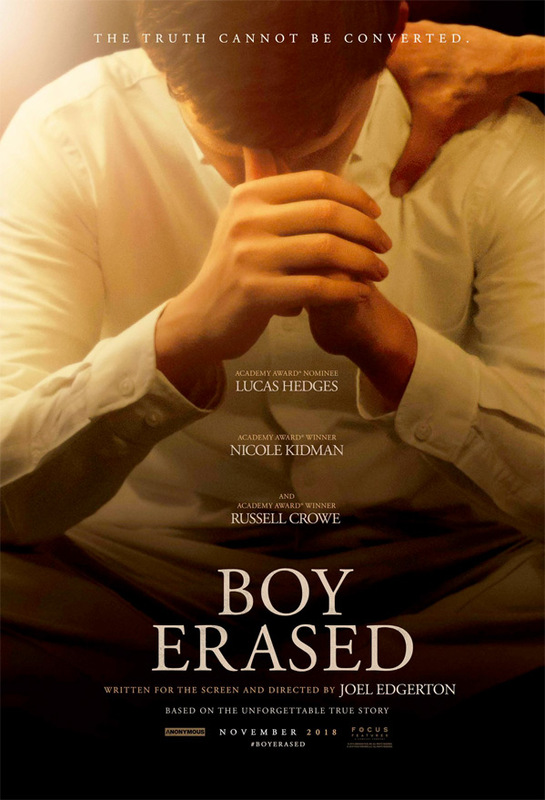 Boy Erased tells the story of Jared (Hedges), the son of a Baptist pastor in a small American town, who is outed to his parents (Kidman & Crowe) at age 19. Jared is faced with an ultimatum: attend a conversion therapy program – or be permanently exiled and shunned by his family, friends, and faith. Boy Erased is the true story of one young man’s struggle to find himself while being forced to question every aspect of his identity. Boy Erased is directed by talented Australian actor-filmmaker Joel Edgerton, director of the film The Gift previously, as well as a few other short films. The screenplay is also written by Joel Edgerton, adapted from Garrard Conley's book of the same name. Focus Features will release Edgerton's Boy Erased in select US theaters starting on November 2nd later this fall. First impression? Thoughts on this trailer?